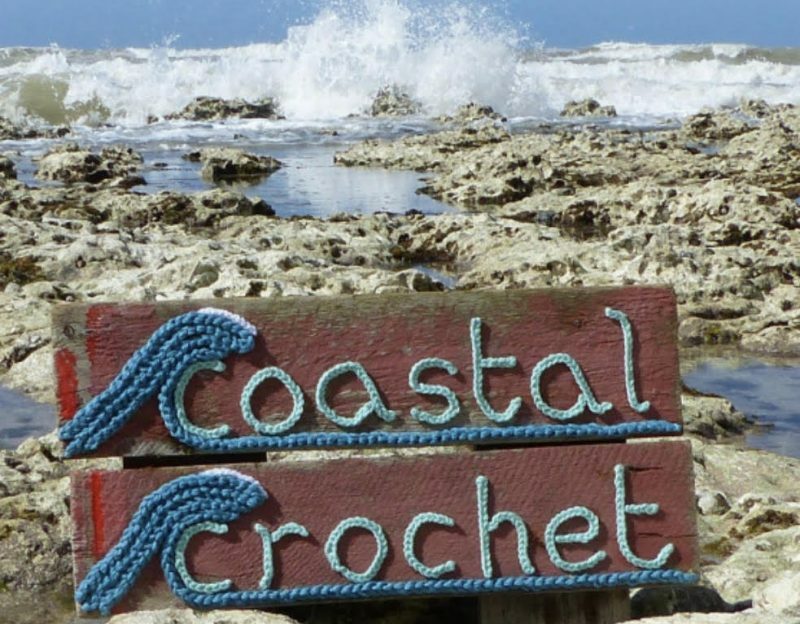 There’s something about Kirstyn’s coastal inspired colourways and names that really gets my design juices flowing and itching to get crocheting! I have a long crochet to-do-list at the moment and deadlines looming, but just sometimes a project with no purpose other than for my own crochet pleasure somehow jumps the queue! I wanted to focus on the ‘Salty Kisses’ part of the name so decided to base the stitch pattern on ‘Crossed Treble’ (US double crochet) stitches… so they resemble kisses! The pattern is available to purchase over on my Ravelry and Etsy stores in both UK and US crochet terms. This is a fun crocheted Dog Bandana designed to be worn with a dog collar. I used some left over DK weight 100% Bluefaced Leicester from ‘Miss Moffat Yarns’ in the colourway ‘Sandy Toes and Salty Kisses’ for the bandana shown. However, you can experiment with all kinds of yarns and hook sizes. A 4.50mm hook. You may need to use a smaller or larger hook depending on your tension and type of yarn used. Scissors, stitch marker and yarn needle. Abbreviations: UK crochet terminology is used. Dc2tog: double crochet 2 together: Insert hook into next stitch, yarn over hook and pull through (you will now have 2 loops on the hook), insert hook into next st, yarn over hook and pull through (you will now have 3 loops on the hook), yarn over hook and pull through all three loops on the hook. Crossed Trebles are now worked. Straight rows of Double Crochet Rib stitch are now completed by crocheting into the back loops only and no increasing at the beginning or end of the rows. To form collar band fold the work over so that the next row is in line with the remaining loops from Row 17 (the front loops we did not crochet into). Row 30 Insert hook through first st and the remaining loop from Row 17 and work 1ss, repeat in each st across, fasten off and weave in ends. Lovely hat & you really suit it. Salty’s bandana is great too. Lovely photos! Great photos, scrumptious yarn and 2 crochet patterns who could want for more?Thank you. Love that part of the world, my mum in law lived at Seaford so lots of visits when our daughters were small. Great pictures and crochet! Always so jealous of the beautiful landscape. Love your models, they make your crochet shine! Is only natural to be inspired by such great yarn names. I love your landscape photo. Those cliffs remind me of the location depicted in the tv drama “Broadchurch” but then I live in the southern hemisphere and for all I know there might be many sections of coastline like that. Spectacular. Your hat worked up very nicely and looks lovely modelled in your photographs. That’s so interesting. Thank you for solving the ‘mystery location’ puzzle. Lovely colours and perfect for coastal crochet. Salty looks very content in the bandana 😁.